Spectacular Bride features wedding fashion captured Mindy Bean Photography. Cinderella meets Princess Bride in this next couple’s look featured in Spectacular Bride Magazine. 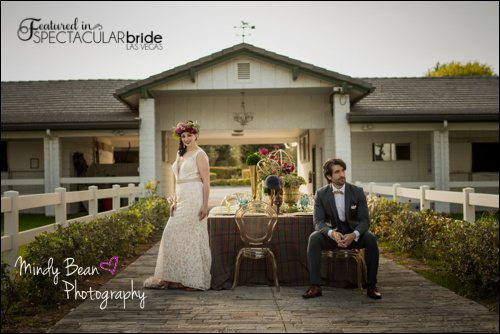 Taken near the stables at the exquisite Casa de Shenandoah, Mindy Bean Photography captured this couple’s style flawlessness. Our beautiful bride, Zelda features a whimsical look wearing a sophisticated off-the-shoulder wedding dress from Silhouette Bridal with a deep plunging neckline, lace detail and open back paired with a breathtaking floral headpiece and bold makeup created by Makeup in the 702. Beside her is our handsome prince, Nathan who is wearing an elegant blue tuxedo with a polished taupe bowtie and pocket square. Together, this couple’s wedding style will certainly leave you with a wedding that ends happily ever after!